CM: Eva Ohlow's series of Architectural and Mathematical Drawings were part of an installation entitled Die Definition des Unendlichen (The Linkage of Parallel Worlds) exhibited in Motherboard: Reincarnation of a Computer Board at the Fraunhofer-Institute, Dartmstad, and DASA-Galerie, Dortmund. The drawings were made as a homage to the ancient Library of Alexandria, which was a center of learning at the time, and they are dedicated to Ptolemy and Eycleid. These drawings are like pages from codexes in the Library as they emerged in the desert. 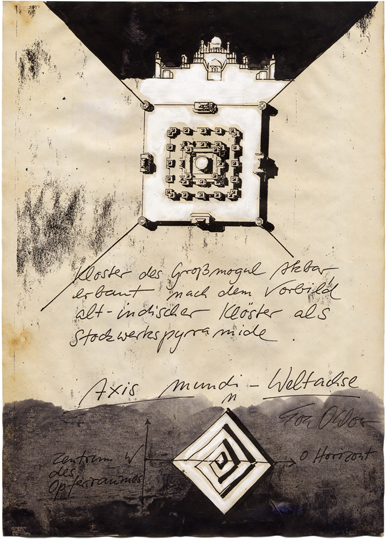 Ohlow's Architectural Drawing #04 represents the Pyramid of the Mogul Akbar, combined with the Axis Mundi, after the Greeks' Omphalos.